Hello, I have a small question, although it is not very important, I will also formulate it. What is the limitation of additions? I know there are people with much more level than others, but a limitation I think the only thing that does is “Limit”, as the word says. And more in this contest that gives you a world of possibilities to the additions, (it seems a word game haha), I mean it is a model in which many we can defend, and make good works of art. Modifications to the geometry of the model are not allowed. I could read the rules of the contest :), but I admit that I found that rule very strange, I think it’s the first time I see it, nothing happens. That can be discussed Bart, you can talk and find a way to work as a team, since competing is good, but it is better to cooperate, we can talk about it elsewhere if you feel like it. Yes it’s a new rule as we got some pushback from participants in previous texturing challenges - they felt that modifying geometry was muddying the waters when selecting a winner. We felt it made sense to keep this ‘pure’. Just open a topic in #lounge and ping me (mention @bartv)! I’d love to work on this, it sounds like a great idea. Ok, that makes a lot of sense! Although I am not in favor of adopting doctrines, I know that they are necessary in some cases, I say this from my own experience, since I have participated in several contests of “Sketchfab”. Well, gentlemen, let someone say something … why the thread is gone! I said, good luck to everyone! 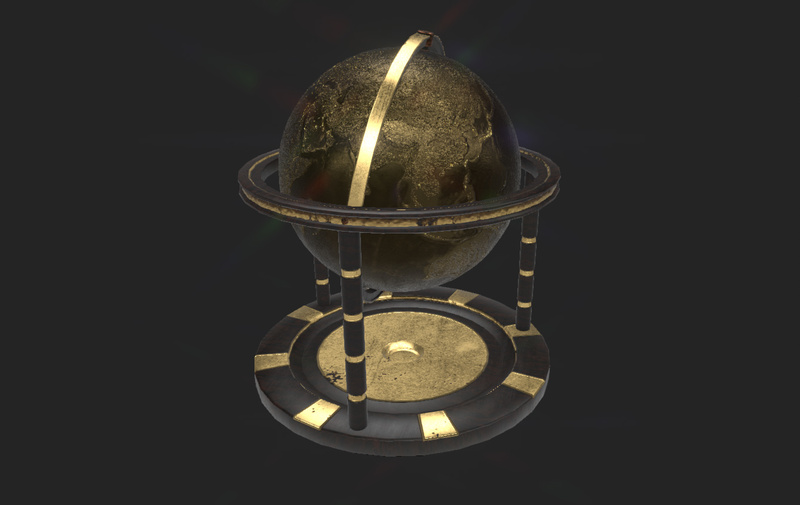 Well I have almost ready, my “Globe” … mmm at least something to show, since I am adding some details, which are never more! It is a metallic globe, with a darkened golden tone, it contains some brass, copper and some oxide that does not lack. And as long as it continues, it will be called “The first terrestrial globe”. I’d say past challenges have been indeed tainted by loose rules so in principle I do agree with the no geometry changes rules but for future challenges I would allow for topology changes.The statue challenge had pretty bad geometry to start with and some of us would rather redo it in a more efficient manner without changing the overall shape and cheating with extra objects. There’s also the possibility that no proper UV projection can be achieved, such as it is the case with the current challenge. Regular spheres are impossible to unwrap without distortion. Sometimes a geodesic sphere is a lot better, as it was the case with my entry. I’m perfectly aware that geometry changes will get my entry disqualified (also the core sun) but I’d rather post this as is so that the Sketchfab community team can decide if the rules should allow changing the surface topology without changing the shape for future challenges. I very much agree, I did not think of a Geodesic form, but I did think of adding more polygons to soften the circular shapes. I have no complaints about the model, I am entitled not to participate if I do not like it, but I still agree with you in all aspects. I read above the rules, I skipped the part where I spoke of the limitation of additions, then 20 minutes I had my model done! When I read the rule, I realized that I had screwed up, and I had to undo my whole scene. That’s why I mentioned that I did not like the limitation (because I had to destroy my model), but it seems acceptable, and above all understandable. Hey, I was wondering, did you try to cut the rules? is to see if you got it to fit well? yeah, I can see where I live! Can you post the image you used for the globe? I suppose that the image you used has rules at the edges of the map, you can eliminate those rules and upload a test terrain globe, to see how it looks? Personally i agree with minor edits, especially if they do not impact the model (i.e making the sphere have a different geo) but once to much gets changed (extra smoothing on round parts etc) it becomes really hard to judge (as it’s a texture contest). I think there could be some minor changes allowed for future models, but writing the rules can be really difficult in that case. “you may change the topology as long as it doesn’t change the final poly count by more than 10% or changes the base shape” , might be a good thing to add for the future to allow a bit of creative freedom without letting people go to overboard. Well, the first time I participate in a Sketchfab challenge! Soon I will upload my entry. I have already uploaded it! If I think about it, it would never have occurred to me to make this model in fabric !! the idea is great. I was thinking original ideas to represent the earth and the idea came out of a wool ball that I have and from that I thought of making a cloth earth, although my initial idea has changed quite a bit from how I initially imagined it. Then I put different heights to break with the spherical shape of the model. I had not planned to present a second model to #GlobeChallenge, but here it is!